Change comes to the art world as the MALBA museum and the arteBA festival appoint their first female directors. 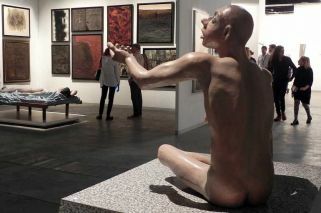 Artists, collectors, personalities of the local art and culture scenes, as well as members of the public, flocked this weekend to exhibitions at the annual arteBA art fair, which began Thursday at La Rural showgrounds. The festival features works by 400 Argentine and foreign artists. It runs from Thursday April 11 until tomorrow, Sunday April 14, in two pavilions at the Palermo venue. Among the novelties of this year’s festival is the strong presence of women curators, who outnumber their male counterparts nine to six. This follows a trend in Buenos Aires' art scene: just last week the MALBA appointed its first female director, Gabriela Rangel, at the same as arteBA’s organising committee confirmed that next year’s edition of the festival will be directed by Amalia Amoedi. Visitors to the festival can find collections of works by established modern and contemporary artists in the Azul pavilion and C pavilion, while in the main building the focus is on the magic of young artists at an exhibit called Utopia, which is curated by Alejandra Aguado. The festival, run by Buenos Aires City’s Culture Ministry, is in its 28th edition. It also includes a series of special talks organised by Art Basel Cities: Buenos Aires, and several side events taking place across the City including arteBA for children at the National Museum of Fine Arts. That museum inaugurates a series of renovated exhibits and a homage to artist Carlos Alonso in its temporary exhibits hall. Meanwhile, the National Historic Museum opens a new Pre-Colombian exhibit. General entrance to arteBA costs AR$ 250.